Two Thursdays ago, I returned to the 1937 Café Royal Cocktail Book after a long hiatus from flipping through its pages. 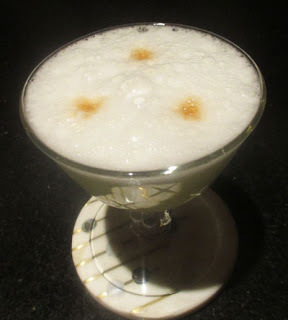 There, I spotted the White Rose that seemed rather delightful as an egg white Aviation-like drink. 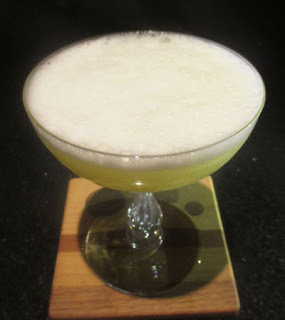 After making it, I discovered that I had already written about Hugo Ensslin's 1916 White Rose Cocktail that varied by utilizing lime instead of lemon; given that it was six and a half years ago, I was not upset to remake this recipe especially given the slight difference. The White Rose greeted the senses with a nutty cherry aroma from the Maraschino poking through the egg white froth. 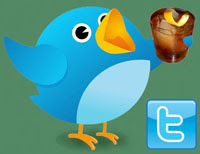 Next, a creamy lemon-orange sip gave way to gin and nutty Maraschino flavors on the swallow. Overall, the White Rose reminded me more of the Cherry Blossom than the Jack Rose, Bermuda Rose, or other "rose" drinks. For my post-work shift drink, I thumbed through my book shelves until I stopped upon Boothby's 1934 World Drinks and How to Mix Them. There, I spotted the Hawaiian among other similarly named recipes. This Hawaiian was perhaps closer to the Hawaiian Room given the applejack, pineapple, and lemon components; that drink was more rum forward, had orange liqueur instead of Maraschino, and temporally came after Boothby's. For a structure, I based things off of the gin and orgeat Royal Hawaiian. The Hawaiian said aloha with an apple and nutty cherry bouquet. Next, lemon and pineapple on the sip led into apple, nutty, and pineapple flavors on the swallow. Given the similarities between orgeat and Maraschino, the balance did come across here like a cousin of the Royal Hawaiian. Two Tuesdays ago, I selected Hugo Ensslin's 1916 Recipes for Mixed Drinks book and spotted the Phoebe Snow. This three ingredient drink was named after a fictional character at the turn of the century who was created to showcase how clean anthracite coal was in trains via jingles like, "Says Phoebe Snow/about to go/upon a trip to Buffalo/"My gown stays white/from morn till night/Upon the Road of Anthracite". 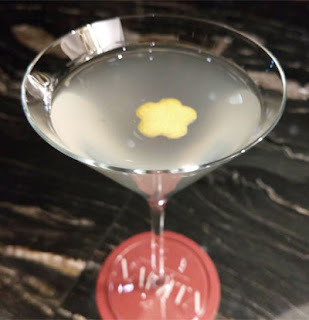 The fanciful New York socialite promoting the Lackawanna railways made such an impact that this cocktail was named in her honor. I had previously skipped over this cocktail for the Dubonnet then was a rather poor quinquina (the reformulated Dubonnet that I tasted over the summer was delicious though; however, I have not yet spotted it in stores); instead, here I substituted another rouge quinquina, Byrrh, in its place. 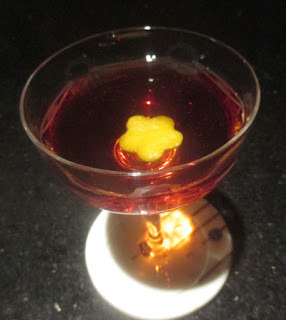 The Phoebe Snow cocktail began with a lemon and grape nose that led into further grape notes with cherry undertones on the sip. 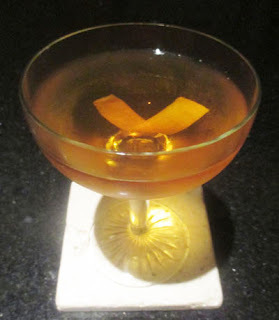 Next, Cognac, grape, anise, chocolate, and quinine flavors rounded out the delightful swallow. 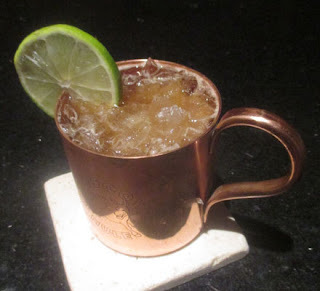 Shake with ice, strain into a Collins glass (Moscow Mule mug), add 3 oz ginger beer (Reed's), fill with ice, and garnish with a lime wheel. Note: the recipe in Boudreau's book is scaled down to 1 oz each of the amari and 1/2 oz lime juice; the ginger beer amount is the same but the garnish is a lime wedge. Two Mondays ago, I reached for Brad Parsons' Amaro book and came across the Italian Buck that reminded me of the unopened bottle of ginger beer in my refrigerator. 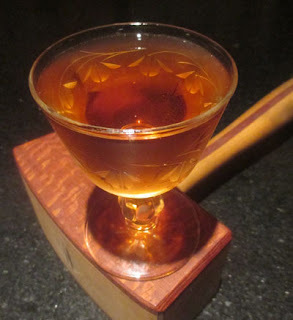 The recipe was crafted by Jamie Boudreau at Seattle's Cannon featuring two bitter liqueurs in a Buck format similar to the Fernet Buck at Deep Ellum. I followed the recipe that Parsons provided, but I later checked in Boudreau's book, The Canon Cocktail Book and noted that some of the volumes were adapted (see the note in the instructions above). 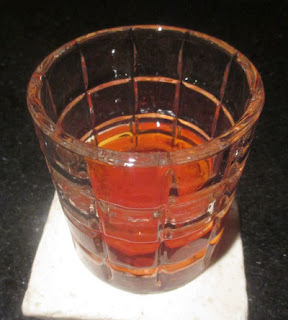 Boudreau also commented in his book that, "While the Cynar carries all the funky bitter vegetal notes, the Montenegro helps round it out with its abundance of citrusy flavors." Once prepared, the Italian Buck welcomed the nose with lime, ginger, and orange aromas. Next, a carbonated caramel and lime sip bucked into ginger, funky herbal, and clementine flavors on the swallow. After a day of visiting brewery tap rooms on Sunday, I was in the mood for a nightcap and turned to Pioneers of Mixing at Elite Bars: 1903-1933. In the American whiskey section, I spotted the Champion that appeared like a Liberal in a Sour format. Once prepared, the Champion donated a rye, orange, and lemon bouquet to the nose. Next, lemon, malt, and grape notes on the sip were beaten out by rye, grape, and bitter orange flavors on the swallow. 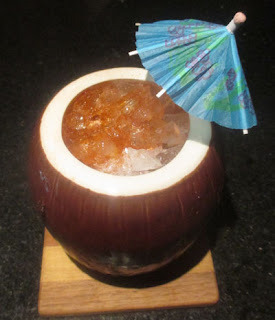 Blend with 1/2 scoop shaved ice and service in a Planter's Punch glass or in a 12 1/2 oz tumbler. I garnished with 3 slices of banana on a pick and 5 drops Angostura Bitters. After a grueling late night buyout at the bar two Saturdays ago, I got home too exhausted to do much more than eat some leftovers and go to sleep. Sunday morning, however, I decided to make up for my lack of home mixology by delving into my Trader Vic's 1974 Rum Cookery & Drinkery. 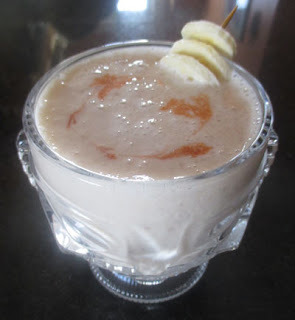 I was inspired by Andrea preparing banana-coconut waffles to make Trader Vic's own Banana Cow which was a banana-forward version of his Rum Cow, and thus, I got out the blender. Without the additional garnish, the Banana Cow proffered a banana and vanilla nose, but with the additional garnish it shared hints of clove and allspice. 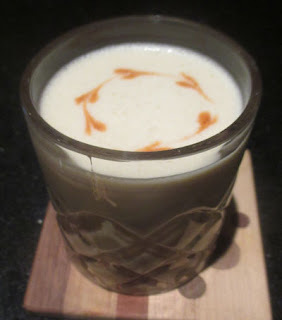 Next, a creamy banana sip gave way to a funky rum, banana, and vanilla swallow. 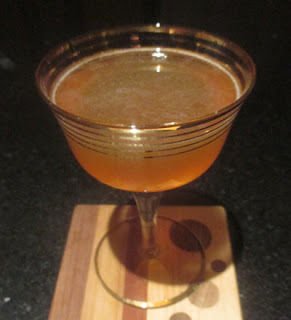 When I got home two Fridays ago, I thought that it might be time to revisit a drink never made it on to the blog. The recipe was the Weeper's Joy -- an oddball combination that appeared in William Schmidt's 1891 The Flowing Bowl. 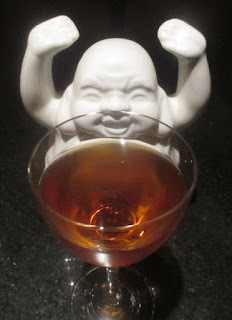 I made that drink before I got a reprint of that tome for I was able to source it from David Wondrich's Imbibe! Many of the cocktails in Schmidt's book were weird ones, and it was not surprising that the 2010 Beta Cocktails zine (the photocopied one that came out between the book printing of 2009 Rogue Cocktails and 2011 Beta Cocktail books) hosted what appeared to be a riff on it called the Spice Trade with overlapping absinthe, kümmel, and curaçao ingredients. For an absinthe, I selected Kübler for its softer balance seems to work the best in my collection with absinthe-forward recipes. Once prepared, the Weeper's Joy offered an anise and caraway aroma that preceded a sweet grape sip. Next, caraway, cumin, orange, anise, and other spice notes filled the swallow. Overall, it was the orange flavors that donated an elegance to the combination. Stir with ice, twist a lemon peel over a cocktail coupe, strain into the coupe, and garnish with a second lemon twist. For a nightcap two Thursdays ago, I delved into my Food & Wine: Cocktails library and selected the 2010 volume. 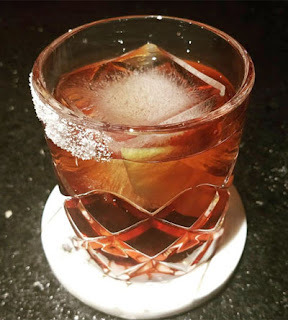 There, I spotted Charles Vexenat's El Catador that he crafted at London's HIX which seemed intriguing with the aged tequila befriending nutty sherry once again but here spiced with Galliano and molé bitters. Strangely, the drink was named after the food taster who ingests dishes prepared for someone else to confirm that it is safe from poison. The Catador had the nose sensing lemon, agave vegetal, nutty, and star anise aromas before determining that it was safe to taste. Next, a semi-sweet grape sip led into tequila, nutty sherry, and vanilla on the swallow with a chocolate and star anise finish. Stir with ice, strain into an old fashioned glass or coupe (coupe), and garnish with a grapefruit twist (lemon twist). Two Wednesdays ago, I was in the mood for a nightcap after my work shift and turned to Clair McLafferty's Romantic Cocktails for the answer. There, I selected the It's Not Me, It's You by San Francisco bartender Christina Mae Henderson that was subtitled, "A little dry, a little bitter, a little citrusy: just like a breakup." I was drawn in for the combination of sloe gin and Fernet Branca in that drink was one that worked so well in the Sloe & Unsteady. In the glass, the It's Not Me offered up a lemon, caramel, and menthol nose that set up a caramel and orange sip. Next, minty, berry, orange, and menthol flavors on the swallow rounded out this complex sipper. 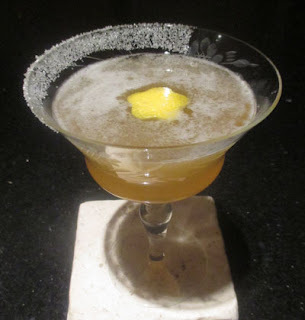 Two Tuesdays ago, I was thinking about low proof cocktails and looked up The Search for Deliciousness that Kirk Estopinal created at The Cure and published in Beta Cocktails in 2011. I wanted to do a mashup to pay tribute to this drink, and the Punt e Mes and lemon juice made me consider Misty Kalkofen's Maximilian Affair as a partner. While I could extract the mezcal and elderflower from the Maximilian Affair, I still wanted to keep the low proof nature and surely the baroqueness of The Search with the drops, multiple twists, and salt rim specifications. For a name, I dubbed this one Carlota's Collapse. When Emperor Maximilian ran into trouble with his regime, his wife Carlota traveled to Europe to search for assistance in Paris, Rome, and Vienna. Carlota's search failed which led her to mental breakdown and a refusal to return to Mexico; Maximilian was executed the following year. Here, a little salt to symbolize tears, smoke for destruction, and Cynar for bitterness. 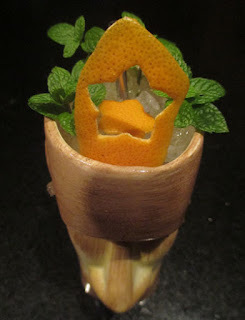 Carlota's Collapse met the nose with lemon, smoke, and dark aromas from the Cynar and Punt e Mes. Next, grape and caramel on the sip reached out to mezcal and floral bitter flavors on the swallow. Shake with ice, strain into a Collins glass with 3 oz soda water, top with ice, and garnish with a cherry-orange peel flag. Two Mondays ago after cooking dinner, I turned to the AlcoholProfessor tribute to David Bowie to make the Jean Genie that I had bookmarked earlier in the week. The recipe was a ginger syrup and orange liqueur-laden Tom Collins that was crafted by Andrew Volk of the Hunt & Alpine Club in Portland, Maine. 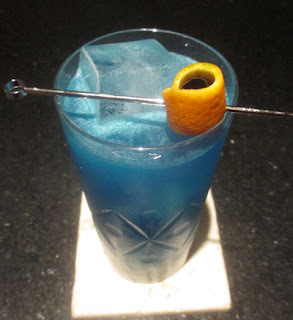 Like the other genie drink I have had, the Genie in a Bottle, it was crafted to be a vibrant blue color. Moreover, the song title was an allusion to author Jean Genet, and the rest according to Bowie was "a smorgasbord of imagined Americana" for this 1972 hit. The Jean Genie welcomed the nose with orange aromas from the flag garnish. Next, a carbonated lime and orange sip snuck off to a gin, ginger, and orange swallow. Stir with ice, strain into a rocks glass with ice, and garnish with 2 lemon twists. Note: the three 1 tsp ingredients were equal parts in a 1/2 oz pour of the mix (and in a previous version were 1/4 oz each). The cocktail that Andrea selected at the Baldwin Bar two Sundays ago was the French Connection that featured the bar's recent purchase of a barrel's worth of Plantation 2009 Trinidad Rum. While Trinidad is not a French island, Plantation Rums are part of the Pierre Ferrand Cognac house, and their brandy made up the other large percentage of the Old Fashioned-like drink. Once prepared, the French Connection smuggled Cognac and rum aromas underneath the lemon oil notes from the twists. Next, caramel and grape on the sip transitioned into rum and brandy flavors on the swallow with light banana and spice accents. 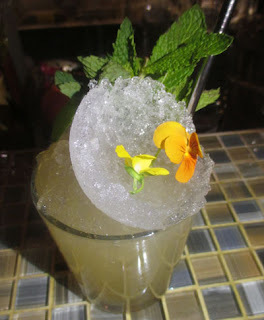 Shake with ice, strain into a double old fashioned glass, fill with crushed ice, and garnish with mint sprigs and an ice shell with edible flowers. For Superbowl Sunday two weeks ago, we wanted to support a bar lacking a television set, so we headed up to the Baldwin Bar in Woburn. 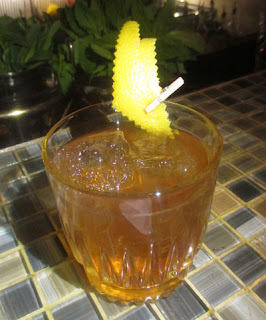 For a first drink, I asked for the Lion's Paw which was their riff on the 1937 Lion's Tail. 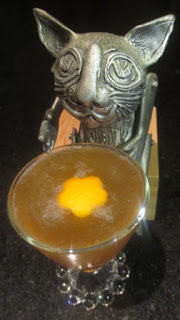 The riff included additional notes of orgeat akin to the A Tale of Two Kitties as well as cinnamon to take things in a Tiki direction akin to the Poison Dart. When the Lion's Paw arrived, even people on the other side of the bar were commenting on how beautiful the drink looked. After that first impression, I was greeted by a mint aroma from the garnish. Next, a creamy lime and malt sip roared into whiskey, almond, cinnamon, and allspice flavors on the swallow. Definitely this riff was much less stark and aggressive than the classic given the addition of orgeat and cinnamon and the reduction of allspice dram. Shake with ice, strain into a cocktail coupe, and garnish with 3 drop absinthe (St. George). After a late, busy night of work, I reached for Pittsburg Drinks and spotted a Corpse Reviver #2 riff that seemed perfect for my near corpse-like tiredness. 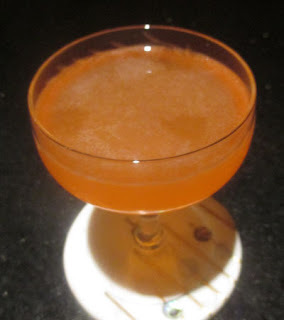 The recipe was the Death's Comeback created by Spencer Warren of Embury in Pittsburg, and the combination of gin, St. Germain, Aperol, and citrus reminded me of Paul Clarke's Dunniette. 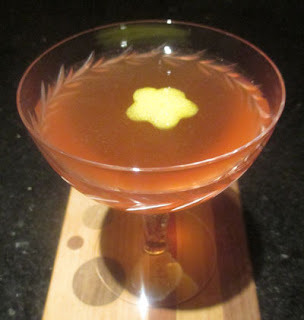 Moreover, the gin, elderflower, citrus, and absinthe aspects made me think fondly of Sam Ross' Sunflower. In the glass, the Death's Comeback shared an anise and floral bouquet to the nose. Next, lime, pear, and orange notes filled the sip, and the swallow transmitted gin, orange, grapefruit, and rhubarb flavors. First published on the USBG National blog in June 2017, and slightly modified for publication here. In a previous job, I was spoiled with a considerable comp tab per bartender per shift as well as certain bottles that we were allowed to pour without charge since liquor companies made deals like “buy 10 cases and get 4 for free.” This allowed us to treat regulars, industry folk, and cool guests to gifts that both increased their enjoyment of their visit as well as added to our tip pool. This was not even considered stealing from the house since it was approved by management. In a later position in a small, young restaurant, we were not as free to comp food or drink or give away pours. For solutions to improve my guests’ experiences, I looked around town to observe some tricks of the trade that didn’t cost the house a dime. One of the consummate barmen in the city used to own his own place downtown before he sold it off to focus on his other restaurant partnerships. Despite not having an amazing spirits selection, complex cocktail lists, or a cutting edge beer program, the place was rather popular, and I frequently was content to drink a few High Lifes and watch the magic. This barman was an expert in remembering people’s names and figuring out what would make them happy. Many of them were his signature stock tricks like when someone got up to go for a smoke, he would fill a shaker tin with ice to chill their bottle of beer as if it were wine service for a nice bottle of white or bubbles. Other times, it was a warm handshake and an inquiry into how one’s job was going; this sincere act was extra meaningful at times when one needed an ear or it felt like everyone else just wanted to talk about themselves. Knowing people’s drink orders and asking if that was what they wanted not only saved time, but it made people feel like true regulars. 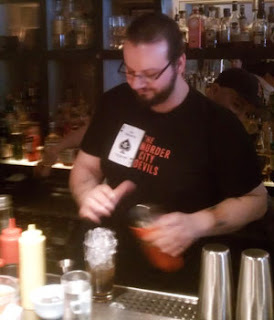 I think the best moment was when I was walking down the stairs one evening, and this bartender immediately took note, quieted the bar, and announce, “Everyone: Fred Yarm is here.” This declaration was followed by a round of applause from the bar patrons. It was surreal, but this act made me feel that this place was special and a welcoming home. Moreover, even 5 years later, this moment still makes my list of most memorable bar experiences both here and in my travels. At a larger establishment across the city, there is a different style of hospitality. There, the food and drink are rather noteworthy, but this was not where they stopped. True, they certainly utilize their ability to comp a round of drinks or send out a complementary appetizer or dessert, but those good deeds are less memorable over time (and sometimes not even noticed unless the bartender pointed that out the removed drink round during the bill presentation). What sets them apart is how the bar team and the restaurant approach hospitality seriously. There is allegedly a database of guest names, photos from social media, their likes, their dietary restrictions, and drink preferences so that they can better cater to their return guests; apparently, they are required to study this data collection so that they can react instantaneously. But to their first timers and even their return guests, they take extra steps to make nights special. One thing they do when guests mention that they will soon be closing out is to ask where they are going next. For the indecisive, they offer recommendations, but for those with plans, they will do every effort to set them up at the next stop. Often, they will call ahead and do their best to reserve seats for them as well as try to connect with the bartender or manager on duty to make sure that these guests get the VIP treatment there. 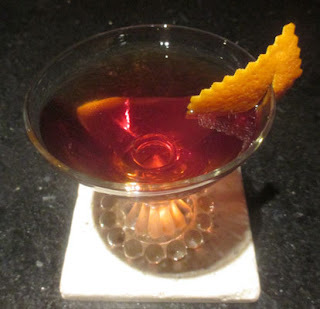 Other things that I have experienced across town include bartenders taking out special vintage glassware for guests who were really into cocktails as well as increasing their garnish game on off-list requests and bartender’s choice requests. Other times, it was the absurd that stood out. At one bar, we were playing the dice game 1-4-24, and the bartender came by and provided a gamer’s dice box to control the rolls. 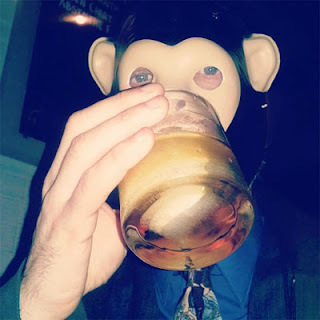 In addition, to make things more interesting, he offered up a mask from their collection of wares behind the bar such that the loser of each round had to wear this monkey mask for the following game round. At several other establishments, it was being taken on a tour of the downstairs wine and spirits room or of the kitchen in response to our curiosity about the place’s layout or other. At one brewpub, it was the brewer seeking me out and giving me a tour of the brewing facility upon hearing about my enthusiasm about beer. Even if your establishment allows you to pamper your guests with freebies, consider the many ways that can be conjured up to make a guest’s experience all the more memorable by being their advocate and figuring out what would best suit their needs. Many of these cost the restaurant nothing and stand out in a guest’s mind longer than a free shot of amaro at the end (although those are generally appreciated in my book). Restaurateur Danny Meyer declared, “The most important thing you can do is make the distinction between customer service and guest hospitality. You need both things to thrive, but they are completely different.” Looking out for how to make your guest’s night special is above and beyond just providing them with what they ask for, but by figuring out what they might need or want without them asking for it. Shake with ice and strain into a cocktail glass half rimmed with sugar; some recipes include a lemon twist so I did too. 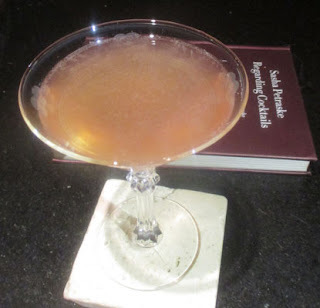 I recently saw a reference to Audrey Saunder's Tantris Sidecar that she created at the Pegu Club, and I decided to revisit it. I returned to my pre-blog LiveJournal and was reminded that I made this shortly after reading about it in Chuck Taggart's blog post in 2007; therefore, I am utilizing that recipe here. 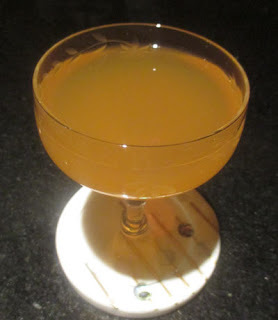 Chuck described the concept as, "This takeoff on the sidecar turns the brandy into a Cognac-Calvados blend, the Cointreau into an orange-herb blend, and the lemon juice into a lemon-pineapple blend, maintaining the original character of the drink but adding many layers of additional flavors." Robert Simonson wrote about this riff in his A Proper Drink book, and he described in greater detail how Audrey broke down the juice component into primary and secondary acids of lemon and pineapple, respectively. Besides dividing the Cognac into a 2:1 mix with apple brandy, she split the orange liqueur with Chartreuse to add herbal notes in a way that reminds me of David Embury's Knight. Finally, the combination needed to be softened, so simple syrup was included "to add the fat." The Tantris Sidecar welcomed the nose with aged grape and apple brandy aromas accented by orange and bright lemon notes. 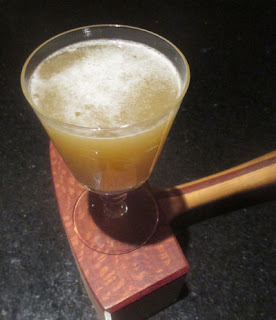 Next, a lemony sip drove into Cognac, Calvados, pineapple, orange peel, and Chartreuse's herbal flavors on the swallow. Shake once without ice and once with ice, strain into a cocktail coupe, and garnish with bitters (Jerry Thomas Decanter) and grapefruit oil from a twist. Two Thursdays ago, I was excited about trying a recipe from a new book, namely Clair McLafferty's Romantic Cocktails: Craft Cocktail Recipes for Couples, Crushes, and Star-Crossed Lovers; I was sent the book as a thank you for my contribution of the Queen of the Lava Beds for the section on drinks for two. 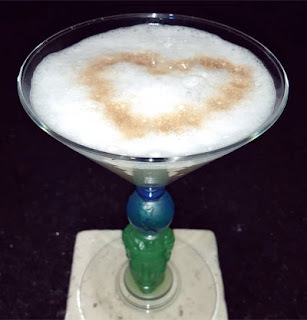 The one I selected was the I Love You Like a Punch in the Head by Beckaly Franks at the Pontiac in Hong Kong that appeared like an agave egg white Sour spiced with Becherovka. The name also worked perfectly with the glass that I purchased at the Central Square Good Will store earlier in the day for $1.99 -- namely, a Richard Jolley creation that he did for Bombay Sapphire back in 1996! Entertainingly, the two week delay in my blog posting lined up with today being Valentine's Day, so here is one for the lovers even if the name shows signs of dysfunction. On the nose, the I Love You proffered clove, cinnamon, grapefruit, and hints of smoke. Next, a creamy lemon sip bobbed and weaved into smoky agave and hints of cinnamon, clove, and ginger on the swallow. Whip shake, pour into a glass (Tiki mug), fill with crushed ice, and garnish with bitters (Angostura) and a pineapple leaf (omit). On Wednesday two weeks ago, I wanted to get one more drink in for Tiki the Snow Away month, and I found the perfect recipe in the 2009 Tales of the Cocktail Stir Your Soul book. The libation that caught my eye was the El Nino crafted by Lynnette Marrero for a "Sugarcane Spirits from Around the World" talk that year. The Orinoco Rum called for in the recipe has been discontinued sometime over the last decade, but it was a white Brazilian rum consisting of molasses rum and cachaça; as a substitute, I selected the mezican Uruapan blend of molasses and sugarcane juice distillates that probably falls in the same ballpark. Once prepared, the El Nino shared a clove and allspice bouquet to the nose. Next, caramel from the dark rum was brightened by the lemon juice on the sip, and the swallow showcased a mix of funky and dark rum notes along with pineapple and anise flavors. Two Tuesdays ago, I returned home from a bonus shift at work in need of a nightcap. 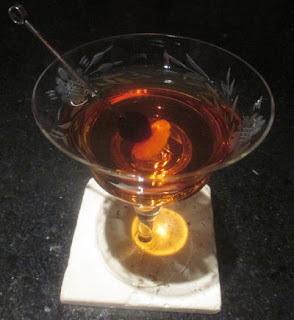 For a solution, I searched my way through Pioneers of Mixing at Elite Bars: 1903-1933 until I found the Morton House that came across like a Scotch Brooklyn with noyaux in place of the similarly nutty Maraschino. 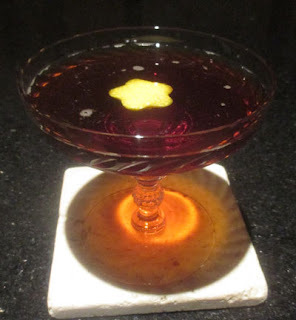 That book also had the Parisian which was a Cognac Brooklyn with noyaux subbing in place of the Picon. As for the name, I was a bit flummoxed for there are many famous Morton Houses. The most famous is probably the 1872 book of that title published by Christian Reid, and the most interesting is an 1890s farmhouse that has been declared one of the most haunted places in America (albeit, the hauntings began after the recipe was created). In the glass, there was less uncertainty for the mix provided a nutty aroma in a fruity-vanilla sort of way. Next, a dry malt-laden sip shifted into Scotch flavors and dark orange melding into nutty stonefruit pits on the swallow. Build in a glass, stir to mix without ice, and garnish with orange oil from a twist. Note: This is a room temperature cocktail. After my work shift two Thursdays ago, I ventured into Sother Teague's I'm Just Here for the Drinks book where I spotted his How Do I Compare recipe. 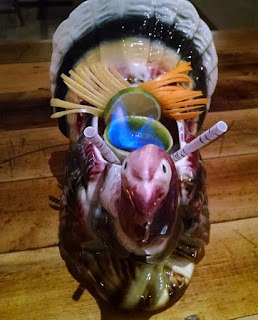 The drink is a room temperature "cocktail" called a Scaffa that fails to be cocktail for it lacks the water component in the 1806 formula of spirit, sugar, bitters, and water. Classic Scaffas such as Frank Meier's 1934 Rum Scaffa frequently called for Benedictine, and I have found orange liqueurs to work well too such as in the Orange Scaffa. Here, the How Do I Compare utilizes both, and the name is in reference to comparing apples to oranges or apple brandy plus bitters and Cointreau, respectively. To round out the mix, Sother split the base spirit with Bourbon, and to answer the naming question, he responded, "How do I compare apples to oranges? I don't. I just drink them." 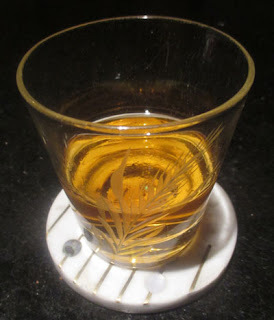 In the glass, the orange element greeted the senses through the orange oil from a twist. Next, apple and the whiskey's malt filled the sip, and Bourbon and apple flavors were joined by orange-herbal notes on the swallow.